When Krampus was released last year everyone was complaining that the film was rated PG-13 instead of rated R. Their logic was that the film was neutered to obtain a more friendly rating. This was far from the truth as the director always envisioned the film with a PG-13 rating. What the director was going for was the PG-13 horror film of yesteryear. In the 80's the PG-13 horror film was all the rage. The films couldn't have much gore to them, so the filmmakers had to use their brains and go for atmosphere and actual scares, as opposed to the gore that 80's films were known for. This brings us to The Gate, a PG-13, 80s horror film that gets lost in the shuffle when 80's PG-13 horror is brought up. The Monster Squad, Killer Klowns from Outer Space, and Critters are always talked, but most people forget The Gate. 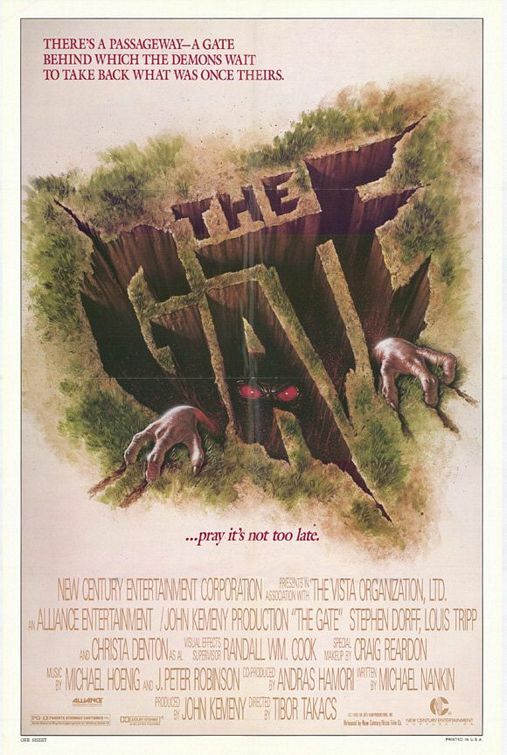 This film has it all: a giant hole in the back yard that is a gateway to hell, a young Stephen Dorff, and some really amazing stop-motion animation. The film is scary without being gory. This is a film that deserves to be found again.